Earlier on this blog I referenced an article by Steve Woods from Eloqua on RPM, Revenue Performance Management. RPM is a relatively new term in the area of demand marketing optimization. Will it stick? As I was writing earlier, there seem to be so many terms already that describe B2B marketing automation. Why another one? Lauren Carlson wrote a post on that topic is a good read. I like of course the idea of scientific, analytics driven, revenue optimization. But I fear that the term is at risk because it is so broad. So everybody is responsible for RPM, and if everybody is responsible the danger is that nobody takes responsibility. Next up is going to be a series on marketing accountability and optimization with digital marketing. After three posts on insights for the considered purchases sector, it is fun now to see now how different the discussion is for customer marketing amd B2C. For that, just tune into Naras Eechambadi’s’ article which is next in our Digital Marketing One series for CMOs. It strikes you that the discussion within B2B (lead management) is all about nurturing clients in leading up to a sale. The discussion in customer marketing is about the long term relationship across many transactions and towards increasing customer value over time. Though both camps might consider analytics driven marketing “the central hub”. Read Naras’ article carefully though. I am amazed how self-evidently Naras includes the ways in which customer marketing has adapted to the 2010s in his writing. “The first step to decide whether to increase investment in your customer marketing is to measure the value of your customer base and to understand the elements that drive the value. Value can be defined in different ways in different businesses—it could be a revenue or sales measure, a profit or contribution measure or even loyalty or advocacy.”, from Naras’ article. Hey, Naras says, it is 2011 and no longer do we need to explain nor go on and on that advocacy via social media could influence whether a client should be considered high value to the company or not. Naras pairs these up with other statements that he takes for granted as a seasoned customer marketer but that make just about any web analyst look like an amateur and makes web analytics software look like a toy. Naras is of course not just “somebody” writing about customer marketing but has deep roots in the industry. He is the General Manager of Quaero, a CSG solution. Quaero (a Unica partner of many years) delivers multi-channel marketing solutions that help companies build long-lasting customer relationships and maximize return on investment. Naras is also the author of High Performance Marketing: Bringing Method to the Madness of Marketing (Kaplan Professional Press, 25). Check out his contribution to the article series for digital CMOs and chime in with your own comments. Continuing our article series for the CMO from Digital Marketing One, next is Eloqua’s Steve Woods on Revenue Performance Management (RPM). Wow, what’s not to like here. 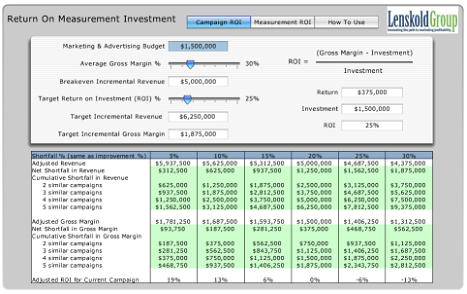 First, analysis is at the heart of managing revenue performance in Steve’s vision. I like how he stresses dashboarding, benchmarking, and optimization as key elements in his article. But in addition, the RPM acronym also reminds you of a car engine’s revolutions per minute. What better symbol for a high octane demand (lead) generation marketing engine! For more info on RPM see the cool resources published by Eloqua on their site. Robert Lesser’s article in the DigitalMarketingOne series is stepping back from lead management and providing a great primer on lead generation in general. Anyone in the trenches with lead gen will know just how much hard work it is. So it is very wise to approach it systematically. Otherwise, despite all that effort, Sales and Marketing may find themselves playing the blame game, for example, because they hadn’t agreed to the definition of a valid lead before starting. Robert was a featured speaker in the recent DigitalMarketingOne virtual summit for B2B digital marketing. Robert’s firm, Direct Impact Marketing, provides on-demand inside sales, telesales enablement tools and direct marketing services. Robert built his experience in a number of marketing positions including Dell, IBM, and others. For more information, visit the Acquiring Minds Blog, or contact Robert Lesser on Twitter or LinkedIn.